What is My Ten Days? The WellGood Campaign from My Ten Days is an initiative in partnership with Fields of Life who work in East Africa to bring water, education and healthcare to those who desperately need it. We want to encourage as many businesses as possible to sponsor a drinking well for just £3,600. Why not use your Ten Days and put on a series of fundraising events? Not only will you be helping a great cause, it's also a great chance to have fun with your team and a brilliant PR story for your business. Once you have raised the money needed for a well, Fields of Life will be in touch to organise a a personalised plaque for the well. This can have your company name and any other specific wording you'd like to include. 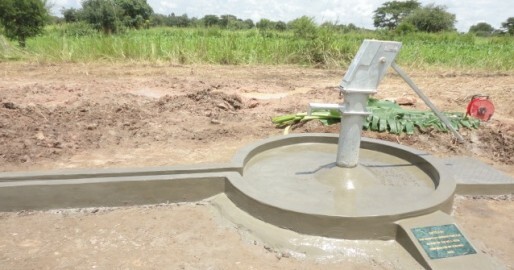 The well is then drilled within 3 months and you will be sent photographs from the beneficiary community. There is also the option to take your team out to visit your well and some of the other Fields of Life projects. So get involved, start fundraising and make a huge difference to the lives of others. STEP 2 - Set up a JustGiving page linked to Fields of Life. All of the funds you raise will go directly to Fields of Life. STEP 3 - Decide how you are going to fundraise. Will you give ten people a day each to do their own event? Or perhaps the whole team will do a series of fundraising activities over ten days? STEP 4 - When you have raised the £3,600 needed to build a well, contact the team at My Ten Days again who will put you in touch with Fields of Life directly to arrange the personalised plaque and the drilling of your well. STEP 5 - Tell all your friends about the WellGood Campaign! It's our dream that every small business in the UK sponsors a well and makes a huge difference to the communities in East Africa.